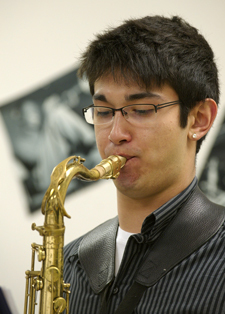 Download a pdf transcript of the SDSU Jazztecs video. San Diego State University has long had one of the premier jazz studies programs in the United States and regularly attracts the finest talent from the U.S. and abroad. The program offers both undergraduate and graduate degrees in jazz studies and its three full-time jazz professors, Bill Yeager, Richard Thompson, and Karl Soukup are complemented by the finest studio faculty available in the region. With a mission of providing the highest quality musical education and to making a substantial contribution to the cultural life of its region and the world, the program strives to reinforce the integral value of music in society. The jazz studies program is committed to turning out students who are competent, passionate, highly motivated and willing to take risks. From education to research, from performance to composition, students can create strong individual profiles to enhance their musical development. Through immersion in an environment of rigorous teaching, open inquiry, and deep exploration, students are encouraged to create works, performances, and ideas that have yet to be imagined. At the International Association of Jazz Educators Convention, famed jazz critic Leonard Feather described the SDSU Jazz Ensemble #1’s bristling set as a yardstick to measure college jazz bands. The SDSU Jazz Studies Program has recently released its new CD, Thought Trains on ACM Records and received a Grammy nomination. The program has recorded four other CD’s that have received rave reviews. Don’t Make Noise on Discovery Records was also a Grammy nominee, Live at Montreux, with guest artist Clark Terry, chronicles the band’s performance/TV broadcast at the legendary Swiss Jazz Festival. The European press writes: The most beautiful moment of the evening came when the magnificent, tight swing playing of the SDSU band accompanied one of the masters of the trumpet and flugelhorn.. Other CD’s include Three Steps Ahead and Where’s My Hasenpfeffer? on Seabreeze Vista Records. The Jazz Ensemble #1 has recently been featured at the Hawaii International Jazz Festival, Ensenada Jazz Festival, the Coronado Jazz Festival, the IAJE convention, the CMEA/CAJ convention, and the CIPJ convention (held at SDSU). SDSU’s Jazz Ensemble #1 has performed with such legendary jazz musicians as George Shearing, Dizzy Gillespie, Diane Schuur, Rob McConnell, Charles McPherson, Conte Candoli, Pete Christlieb, Bobby Shew, Lanny Morgan, Mundell Lowe, Don Menza, Marv Stamm, Bud Shank, Gabe Baltizar, Tiger Okoshi, Gary Foster, Kim Richmond, George Roberts, Holly Hofmann, Ernie Watts, Dave Friesen, Ed Shaughnessey, James Moody, and Barney Kessel, to name only a few. As winners of the National Collegiate Jazz Competition, the band was invited to perform at Epcot Center in Orlando, Florida with Wynton Marsalis, Pete Fountain and Louie Bellson. SDSU student jazz groups have toured throughout Europe, Taiwan, Bolivia, Costa Rica, and Mexico.